Doing some housekeeping and wanted to do a recap of some of my fave projects from the past year. Here's a quick rundown. Graduation cake to incorporate both the high school and intended college of the graduate. Anniversary cake for 3 couples who vacation every year together at the beach. All of the background environment is done in modeling chocolate. Figurines are fondant and gumpaste. Baptism cake covered in fondant with wafer paper flower and hand-punched lace ruffles. Pig cupcakes for a woman who played an important role in finding a home for some rare pig breeds in a protected environment. Elmo birthday cake for one of my best clients. Birthday cake for the wife of a lifelong friend. Customization in full color. Groom's cake designed to incorporate his career as an accountant with his love for golf. Fondants are homemade: chocolate and vanilla marshmallow. 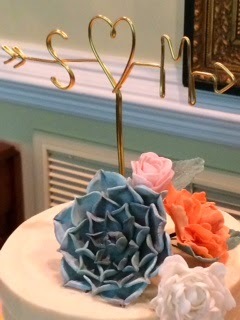 Pretty cake for a spring birthday. Thanks for viewing! Until next time...confectionately yours! Hello lovely people! I have been so very remiss in not keeping up with my blog posts. Especially as they pertain to caking! I rely on Facebook alot to update folks on projects, but I know many of you have been smart enough not to fall into the Facebook black hole. So, these are for you! Lots of pics, showing projects that date all the way back to October! 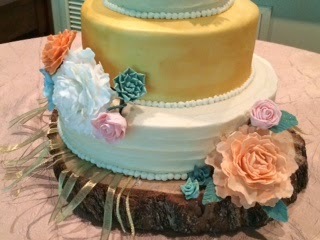 Wedding cake for dear friend, Sharyn and her Modern Vintage wedding. 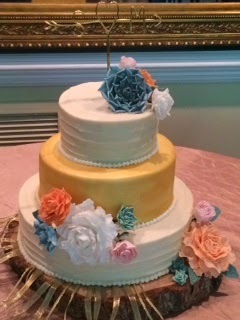 She provided a pic of her flowers and color palette, said she wanted one tier painted gold and the others in a fairly simple ridged buttercream pattern. Here are the flowers. 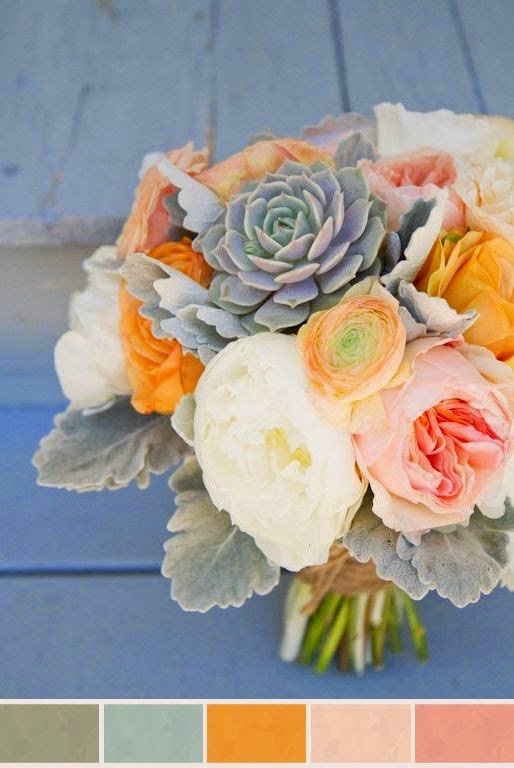 Love the succulents and peonies. 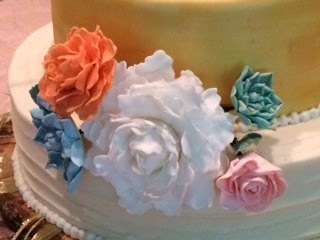 All of the flowers are made of sugar...fondant and gumpaste. I love making these flowers. It's such an artistic process, but also very methodical, which is actually pretty therapeutic. 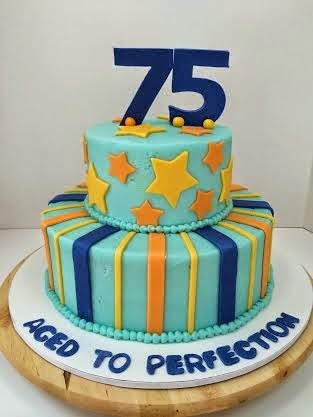 I am so thankful to Youtube and the cake artists who share their expertise on these techniques. Sharyn provided the cake base and the adorable topper. Also included are cake pulls, which are "fortune charms", attached to ribbon and inserted under the cake. Bridal party members and/or select guests pull a ribbon to find out what their fortune is! Such a unique tradition that I believe originated in New Orleans. I'm thrilled with how this cake turned out. 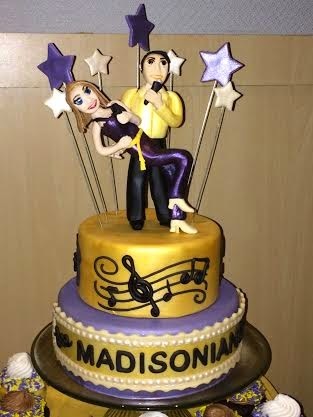 Next up, a cake to celebrate a very special reunion of the group that gave me start as a professional singer/dancer. The Madisonians, from JMU, were together around 40 years, collectively. Several of us from different generations gathered on campus recently to celebrate each other and our love of music and performing. It was a magical weekend! 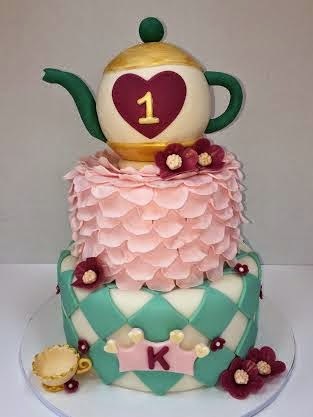 A "One-derland" themed cake to celebrate an adorable little girl's 1st birthday. 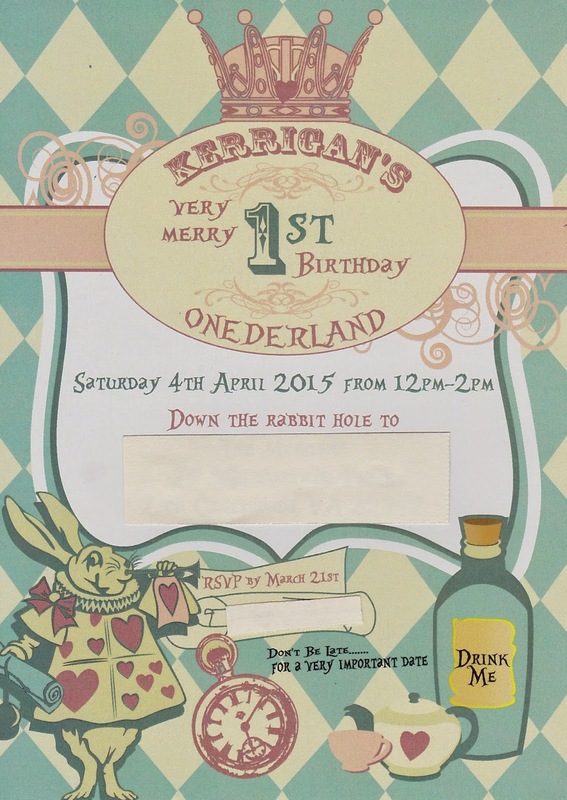 The tea party/Alice in Wonderland themed party and invitation provided the inspiration for the cake. Off the cake train for a moment, these mini-pies were made for bride Sharyn's shower. Flavors are Apple-Ginger Crumb and Tangy Blackberry. Thanks to her sister and my darling friend, Sassypants Marcee, for the order! 75th bday party cake for dear friend Steve's Dad. Colors and design were selected to complement plates, napkins and party decor. 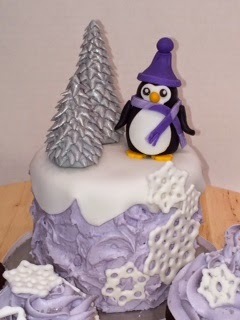 Winter "One-derland" 1st birthday party smash cake and cupcakes. 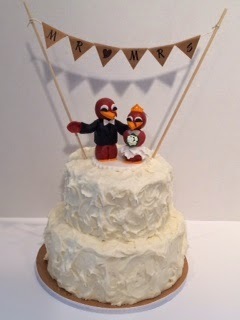 For all you VA Tech fans, a charming Hokie wedding cake. 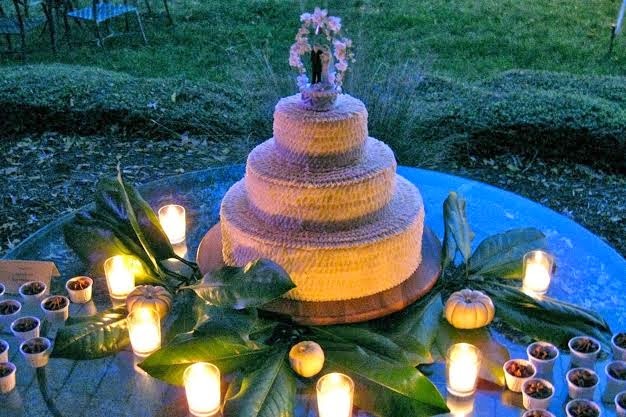 Buttercream ruffles galore for this October bride. Also served up were buttercream shots in Bailey's Chocolate flavor. I know you have been sitting by the computer, just waiting for this email with the big reveal. Or not. 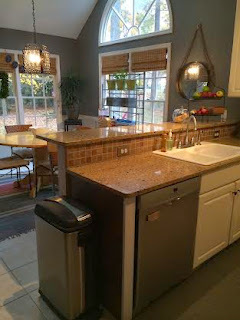 I just had to find some time to do a decent cleaning of the kitchen before I could take the after shots! Considering this was just a surface refresh of a builder grade bonanza, I think this is a pretty noticeable transformation! Kind of like Botox instead of a full facelift, right? 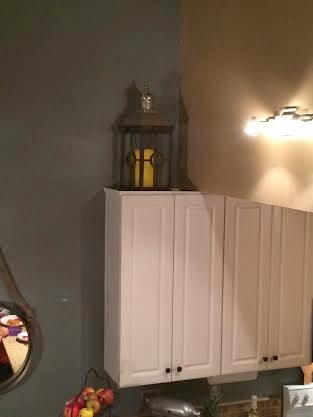 Goes to show what a little paint can do and the mini construction projects of board and batten and "reclaimed wood" on the peninsula are totally DIY-able! I feel like this room is so pretty now - and much more of this decade. Now on to some of the finer details. As important as paint, flooring, cabinets, furniture all are, I don't feel that a room comes alive until the personal touches are added. Those things that make it sing and make you a part of it. I took some time assembling all the finishing touches in this room. Several of them have been lying in wait for months or even years, waiting for the right place at the right time. Others are newer finds - things that I happened upon and were a perfect addition. I am not a big believer in accessorizing every inch, so each piece had to matter. This was actually an accidental find/hand-me-down from my dear cousin, Robyn. She gave us the canvas many months ago, with the intention of having one of the boys paint over it. 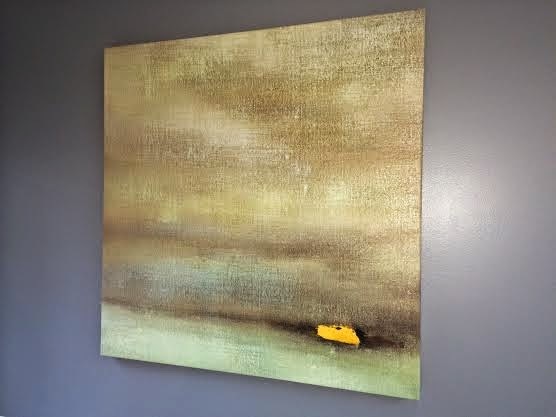 I loved the colors and abstract nature of it, so it never made it to their easel. 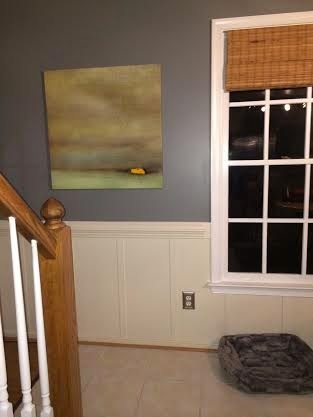 After I chose the grey paint, I hung the painting and it never came down. I love the contrast of the greens with the grey and it complements my existing plant pots perfectly. It has become a launching point for the room's color scheme. Thanks, Robyn! No big story here. Found it at Tuesday Morning at a fraction of what I had seen it for elsewhere. I think I paid $38. Love the rope. It's a statement in the room. Every room needs some. 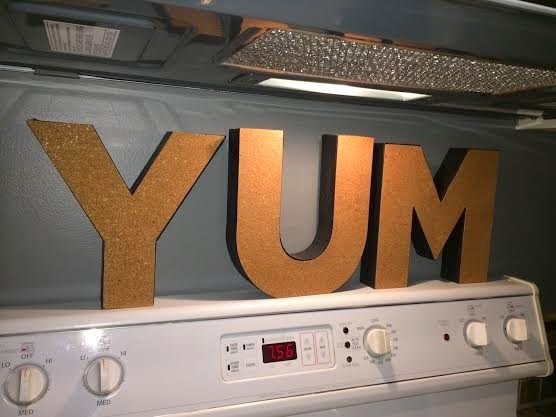 These letters were in the college decor section at Target. They provide a little unexpected and keep me from taking the room and my cooking too seriously. 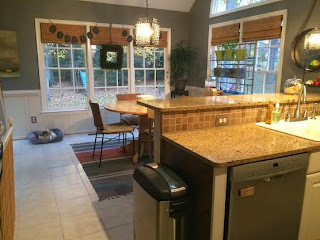 I did not have a rug in the dining area before, but I felt it necessary to break up all the lightness in the floor, board and batten and cabinets. My choice was a compromise. I wanted a square rug to accommodate the round table, so my options were already limited. 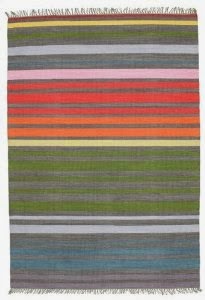 Not a ton of affordable square rugs out there. 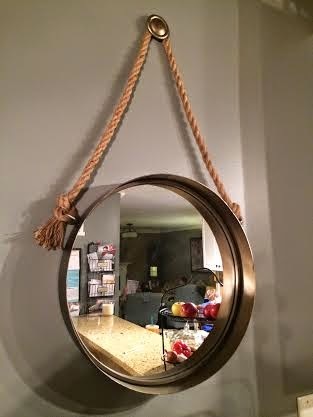 I found one on Overstock that I loved. A rag rug that had a more contemporary look to it and seemed to have the right color palette. But, I waited too long, went on vaca and when I came back, it was sold out. Found this one on Amazon (my version is square). To be honest, it is probably better because it is darker than the rag and therefore grounds the space a little better. I really do like it...just had my heart set on a rag. The good thing is that it has alot of color variety so I am not locked in to greys, greens and blues. I love this light. It is a very sentimental piece for me. Mom and I found it about 20 years ago while antiquing in San Diego. I bought it and told her that I would save it (I was in my Strawberry St. apartment at the time) for my first home. It was ugly...a dirty cream color with green flecks. I painted it high heat matte black. 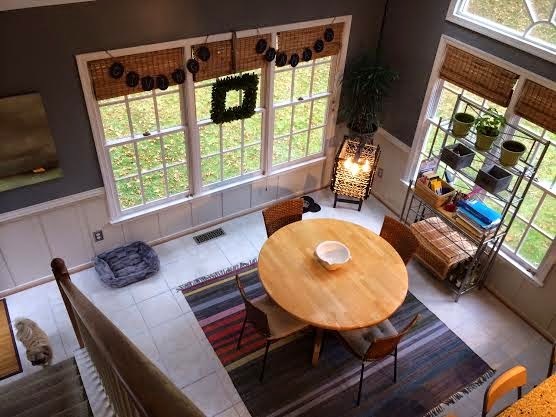 We did have it hanging in our first house, and it has been in the dining area in this house since we moved in However, I never felt like it was noticeable in the old scheme. In the refreshed space, it is simply gorgeous. I think it is also right on trend right now as I am seeing square iron fixtures everywhere. Mine is different than those though, and oh so special. There is a corner in the kitchen where the cabinets protrude into the vaulted area, creating a shelf that sits up about 9 ft. high. Every time dear Auntie Nana (aka Sharon) used to visit, she would say "you need to put a plant there". I wasn't a big fan of that idea as I was not about to climb on the counter to water one every week and I didn't want "faux greenery". And I was also not convinced that I absolutely had to have something there. However, when this facelift was happening, I thought I would try to come up with something. Enter this lantern. Again, no real story. Just found it at Homegoods and put a fake candle in it. I had never used those before, but can I just tell you...I love those things! It has an automatic timer that turns it on at 5 and off at 10 and it puts off the most natural candlelight! 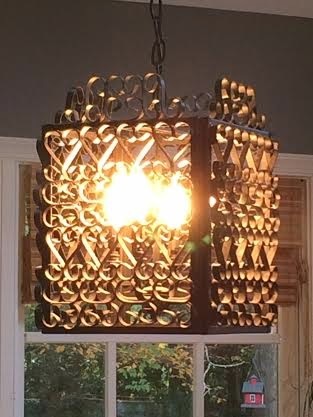 I love the wood tone of the lantern and the bling on the top. Every room needs some;) Score...just sorry it took me so long to fill that space. Finally, I'll finish up with the dishwasher story. Right in the middle of all of these projects, the dishwasher bit it. We weren't surprised. It's been on its last legs for awhile. These things just never come at the ideal time. 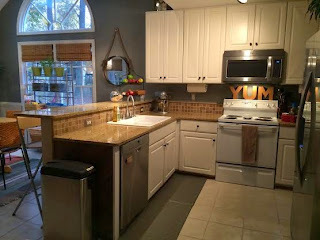 We have been replacing the old, white appliances one at a time, as needed. Only the stove/oven is left. So we research, shop, research, shop some more...all while hand washing a gazzillion dishes. We find a good deal on a very nice Bosch, but we have to order it. More hand washing. It finally arrives, the guy comes to install and it's too tall. 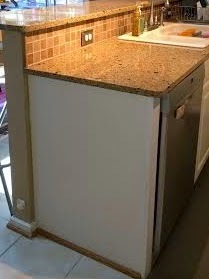 The previous owners had installed the tile over the original vinyl and added a 3/4" backer board, basically boxing in the old dishwasher. The installer was able to lower the legs enough to force the old one out, but the new one was absolutely not going in. Since we have quartz counters, altering the counters was not an option. Therefore, the installer had to leave and I had to chisel out several of the tiles in front of the peninsula. What. A. Pain. 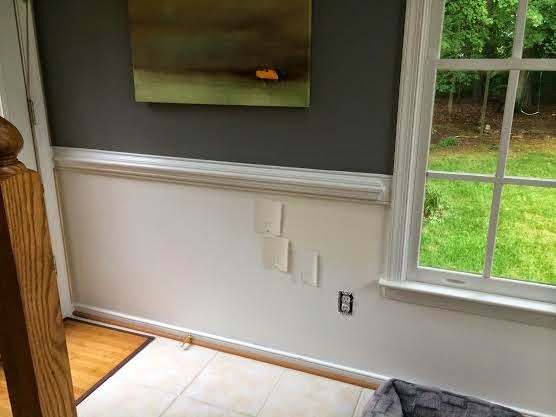 I can't believe what a shoddy job the installer did on those floors. They are wrong in so many ways. I REALLY wish I could have just ripped out the whole floor while I was at it. 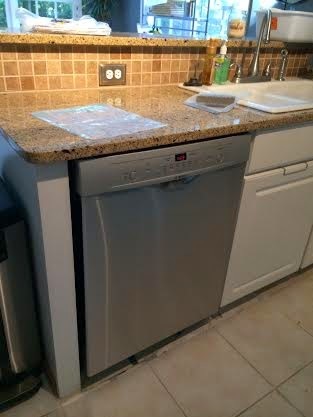 But, I was desperate to have my dishwasher back (and needed it for caking), so once I was done, he came back and managed to get it in place. 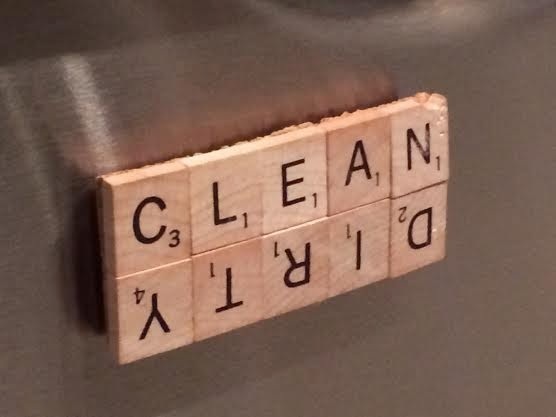 We love the new dishwasher, but here's the dilemma. What if it needs to be removed for a repair? 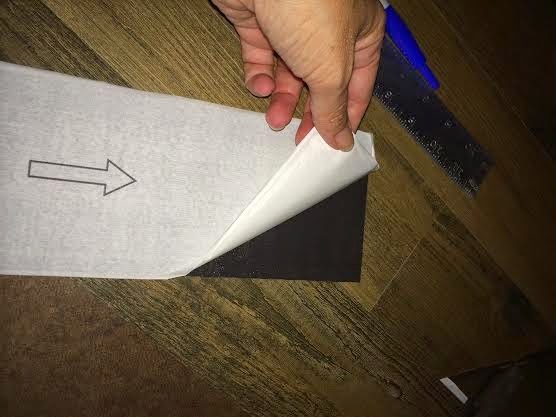 I don't want to re-install tile only to have to rip it out again. So, until I decide what to do, a pretty gel mat will act as a band-aid and keep my feetsies comfy at the same time. Now...the floor repair project will just have to wait. No time and no patience. In the meantime, I am going to pretend like there is not ugliness hiding under the rug in my beautiful new kitchen. Sigh. The big reveal is coming soon! Ok - sorry I had to leave so abruptly last time. Time got away from me! Well, I don't have a true island like this one, just a peninsula. And I didn't want to completely rebuild anything, just cover what is currently there. Additionally, I wanted to ease into it. Wasn't sure how much of a commitment I wanted to make in case it didn't turn out the way I had planned. Jeez, I obviously had many conversations with myself over this whole thing. Got a little sick of my internal dialogues after awhile. Anyway...I decided to start with the end of the peninsula. The part that is most visible from the family room. The rest of the peninsula that could be covered is only visible from the kitchen dining area anyway. Here's the "canvas". More on that crazy dishwasher later. That's a completely different story. You can't really tell from the picture, but the end panel is slightly recessed, giving me about 3/8" to play with. Not much, which really limited the kind of wood that I could put there. I wanted to try Stikwood, which are real wood panels that are thin with an adhesive back that are created specifically for decorative wall installations. Exactly what I needed. However, it's crazy expensive because you can only buy in larger quantities. I would have had to spend about $300. So I started checking out everything I could find. 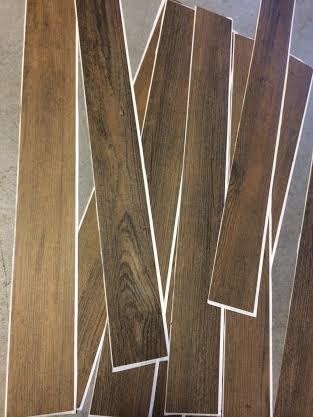 Real distressed wood, "distressed look" engineered, laminate, pretty much anything they have online and in stores. Since this was more of an experiment, I decided to go with something easy to work with and inexpensive. 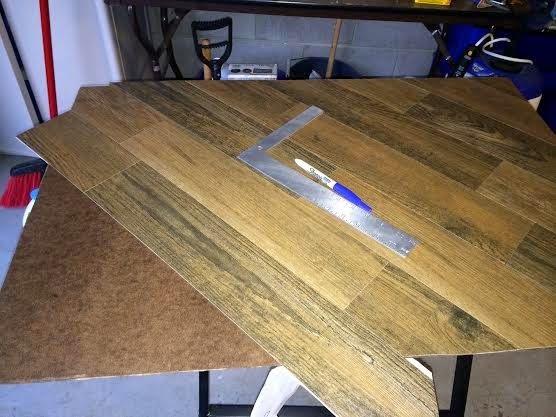 The winner was an adhesive vinyl plank from Lumber Liquidators. What?? Not at all what I was planning on, but it is actually a decent looking product and the price was right! $20 for the entire box, which leaves me quite a bit to spare. It even has texture to it and you can't tell it's not real unless you get right on top of it. 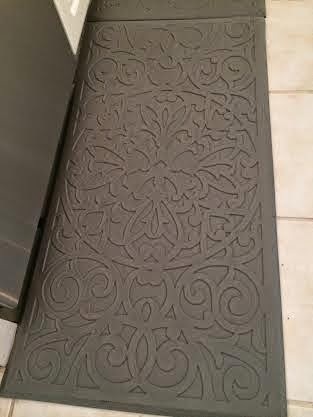 Instead of a permanent installation, I decided to start with cutting another end panel - exactly like the one that you see in the before pic. That would be a "backer board" for my wood so that I would not have to permanently attach the wood to the unit. If I didn't like it or got tired of it, I could just take it off! Yes! 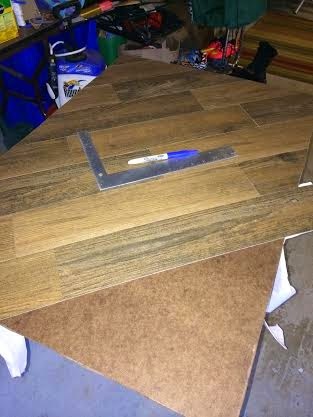 Once I had my backer board cut to size, all I had to do was start to lay the planks. I chose a diagonal pattern, which is a little unexpected and draws even more attention to the area. The most amazing part is that because these are so thin and pliable, I literally cut the excess off with a pair of scissors! 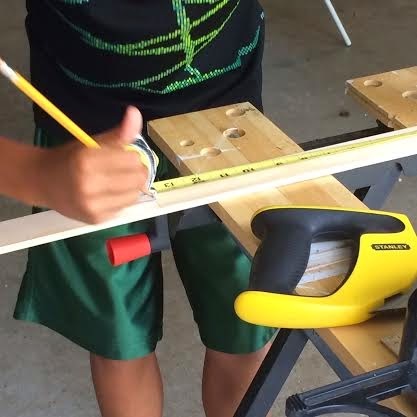 No sawing necessary! Once they were on and I was happy with the result, I put the panel in place and attached it with a nail. Yep, one nail did it. I have to say I am pretty darn happy with it. Much of it gets covered with the trashcan, but it's still a very impactful feature and I often find myself admiring it when I am sitting in the family room. Mmm, so pretty! I do need to go back and use some stronger adhesive on some of the pieces. 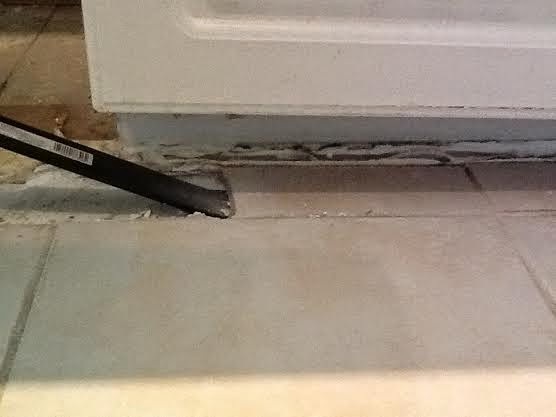 Because the dishwasher is adjacent, the heat from that sometimes loosens the glue and the planks fall off. No worries, I'll just use a stronger adhesive and they should be fine. What do you think? More lovely kitchen details coming in Part 3! So, let's go back to the starting point. When we first moved in, we were working with forest green "faux marble" laminate counters, the current white cabinets, tan walls above the chair rail and lovely floral white and green wallpaper below the chair rail. The's 90's in all their glory. The flooring was and continues to be the bane of my existence, white tile with white grout. Seriously?? Why would you do that in a kitchen? The one room with with dirtiest floor in all of the house! I have hated it for 7 years now and will continue to hate it, but we have about 300 sf of it and can't afford to replace it. So, I am trying to find a way to live with it/ignore it. Yeah, right. It haunts me. I set to work transforming as best I could, with the first project being the counters. We spent a chunk and went with quartz, which I still love. 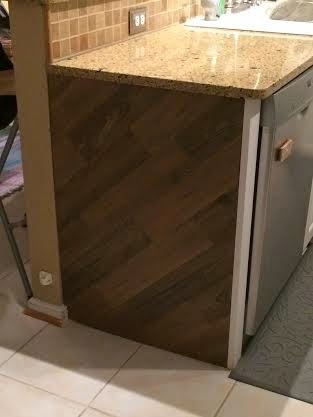 Then I taught myself to tile and did the simple backsplash shown below. The wallpaper came off and I painted the whole space a rich red, which at that point, made my heart sing. I also removed the window treatment hardware and installed rattan blinds inside the frames. Simple and classic. 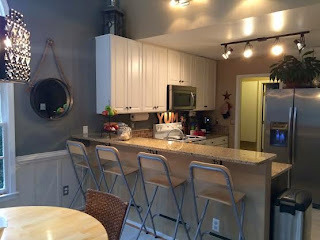 Ok, so fast forward to a year or so ago, and I am getting antsy for some change in the kitchen. I was itching for something fresh, a little eclectic and a way to boost the architectural features without spending a boatload. Then I saw it...the dream kitchen. I could picture myself walking through that door and whipping up a cake or soup and salad, while my friends sat at the island sipping coffee. Heaven. I mean, look at that oven hood and island finish! And the grey and white with wood accents is stunning. My wheels turned to...what if I won an HGTV kitchen sweepstakes and could completely change the footprint of my kitchen? I knew exactly what would need to be moved to achieve the same look. Then, I snapped out of it and asked myself how I could fake it. Then, I set to work. First up, paint. Let me tell you, grey is hard to get right. The big pics are coming later, but I am very happy with the result. A medium grey that grounds the room a bit since there is so much white in the cabinets and flooring. As I was painting, I realized that I kind of liked the white below the chair rail, so I decided to teach myself how to do a board and batten effect. It's fairly easy to do, cost effective and really elevates the architectural integrity of the space. The boys and I made it a summer project. 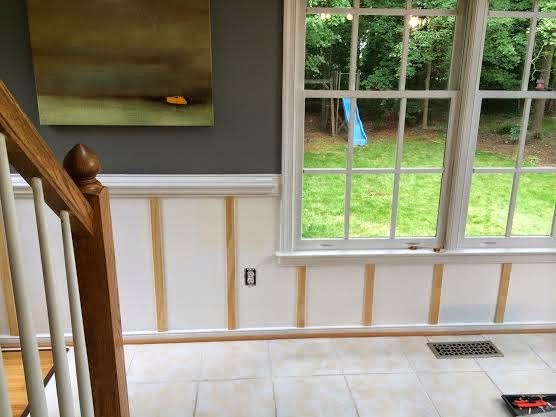 We started with measuring how we wanted the battens spaced, taking into account the outlets, windows, etc. I think we ended up with about 14" between each. 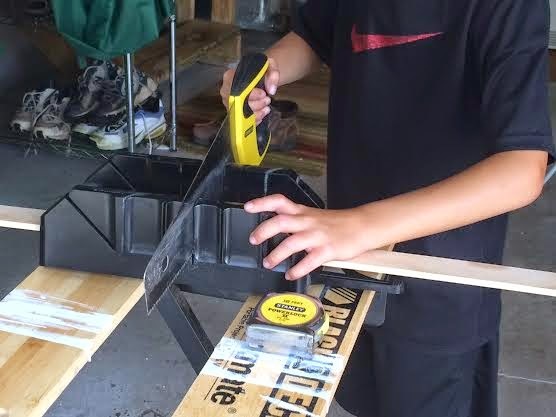 We purchased unprimed lattice from Lowe's and I had the boys measure out the lengths and cut them with a miter box. They did a great job. 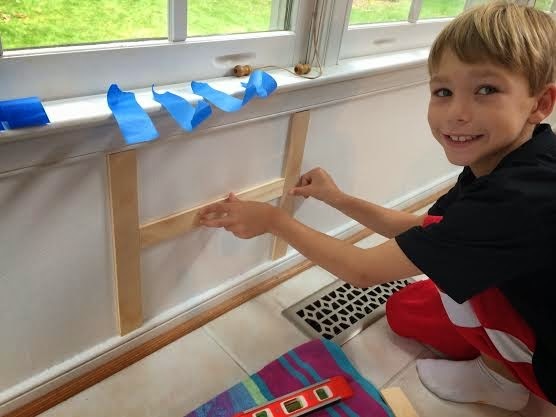 Next, we used our spacer stick to place our battens and tape them in the place. I then borrowed a friend's nail gun and compressor. Wow! What an amazing rush being able to knock out a project so quickly. It took me about 1/2 hour to nail all of the pieces in place! Last was caulking the edges to give a finished, professional look. After all the construction was completed, I really struggled with what color white to paint it. 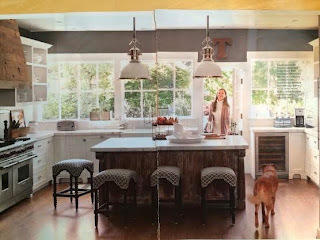 I tried several samples and finally landed on Natural Tan from Sherwin Williams. I chose it to help pick up the slight bisque color in the floor tiles. I still don't love it, love it, but unless the floor were darker, I don't think I ever will. Ce la vie. I have become quite long-winded this post, so I will sign off for now. Stay tuned for phase 2, coming soon!